BNSF Railway Co. said March 9 it will invest about $90 million this year to maintain its freight rail network in Minnesota. The biggest part of the Texas-based company’s capital plan in the state involves replacing and upgrading rail, rail ties and ballast, the main components for its railroad tracks. BNSF says it has invested about $810 million over the past five years to expand and maintain its network in Minnesota. The program this year involves more than 750 miles of track maintenance work, and replacing 20 miles of rail and close to 170,000 ties. BNSF spokeswoman Amy McBeth said the maintenance projects will occur throughout the state. 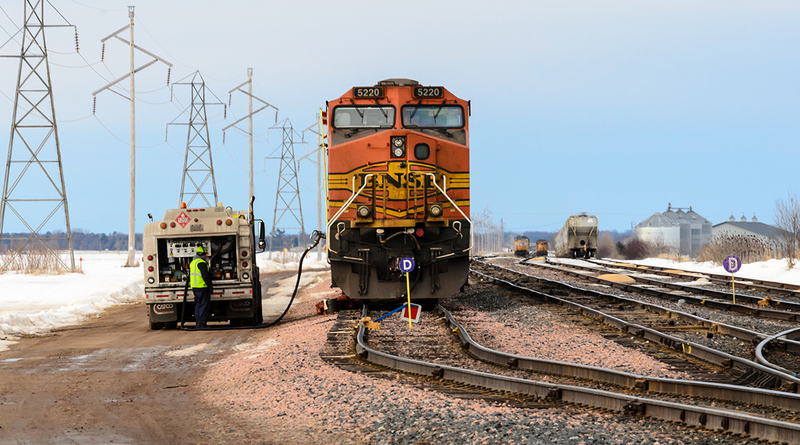 Crews will be working to replace 9,000 railroad ties around BNSF’s Northtown complex in Minneapolis and Fridley, as well as 35,000 ties between the Northtown complex and St. Cloud. Another 36,000 ties will be replaced between Delano and Willmar. “As a part of the Great Northern Corridor, Minnesota serves as a crucial link between the Pacific Northwest and Chicago, ensuring that every year BNSF moves more than 140,000 carloads of Minnesota corn, wheat, soybeans and other agricultural products, as well as large quantities of timber and paper products to both global and domestic markets,” said Chad Sundem, BNSF’s general manager of operations for its Twin Cities Division, in a statement. The improvements in Minnesota this year are part of the railroad’s overall $3.3 billion program throughout its network. BNSF operates about 32,500 miles of track in 28 states and in three Canadian provinces.